Recorded in New York City, January 13-14, 1954. One of the happiest openings in recent memory occurred at the Ziegfeld Theater in New York on December 3, 1953 when Kismet raised its curtain on a display of rarely equaled magnificence and color. As it happened, New York’s newspapers were not publishing that week, thanks to an engraver’s strike, and the next morning there were no reviews. However, radio and television critics leapt into the breach with eagerness and goodwill, and were shortly followed by magazine critics, all of them passing along the word that Kismet was a show that delivered everything it promised, which was considerable. The concern of this collection is not the many glories of Kismet, but its newest and brightest, the score adapted from the music of Alexander Borodin by Robert Wright and George Forrest. As classical music lovers know, Borodin was one of the greatest Russian composers, leaving behind him a comparatively small but nevertheless fascinating body of work, rich in long, spacious melodies and exciting rhythms. From this thematic treasurehouse, Wright and Forrest have constructed a brilliant score glowing with the colors of old Bagdad and the exotic atmosphere of the Arabian Nights. From its overture to the finale, Kismet tingles with the blare of brasses, the sound of cymbals and triangles, the roll of drums, all of them adding immeasurably to its excitement. This re-construction of a score, the building of new music on the themes of old, may not perhaps please the purists, but it gratifies the huge audiences that squeeze themselves into the theater, and those who hear it on records, either in Columbia’s superlative recording by the original Broadway cast, in this orchestral presentation by Percy Faith, or in the first hits of 1954, Stranger in Paradise. Moreover, it gives a consistent texture to the fabric of the show, pointing up situations, underlining romantic exposition, creating, in fact, its own special atmosphere. As it happens, the editing has been done by a pair of experts, the same who adapted the music of Grieg for Song of Norway, with a success that is still remembered. In Kismet, the listener will find familiar themes mingled with unknown and interesting material from Borodin’s works. Not unnaturally, the larger portion of the score comes from Prince Igor, an opera immense in size and intent that is rarely produced in this country. From the short orchestral piece “In the Steppes of Central Asia” comes Sands of Time, an evocative ballad that opens and closes the show. Stranger in Paradise, the unquestioned hit of the show, is adapted from the exciting “Polovtsian Dances” in Prince Igor. One of the loveliest melodies in the whole of music forms the base of And This is My Beloved, which has been adapted from the Third Movement of the Quartet No. 2 in D Major, while Fate comes from the Symphony No. 2 in B Minor. The lilting Rhymes Have I, and Not Since Nineveh is another adaptation from the “Polovtsian Dances,” as are Bazaar of the Caravans and He’s in Love. A little-known piano composition called “Serenade” provides Night of My Nights. All these have been arranged by Percy Faith in a sumptuous series of settings that evokes Kismet as surely as its rich trappings and notable performances. One of the most gratifying aspects of his arrangements is that they have been conceived for records with the result that only music pertinent to the mood has been included. Again, effects are possible in the recording studio with gongs, bells and similar instruments that are impossible to obtain in a theater and might even distract from visual action. Here the action is all auditory, and a wonderful panoply of sound it makes. 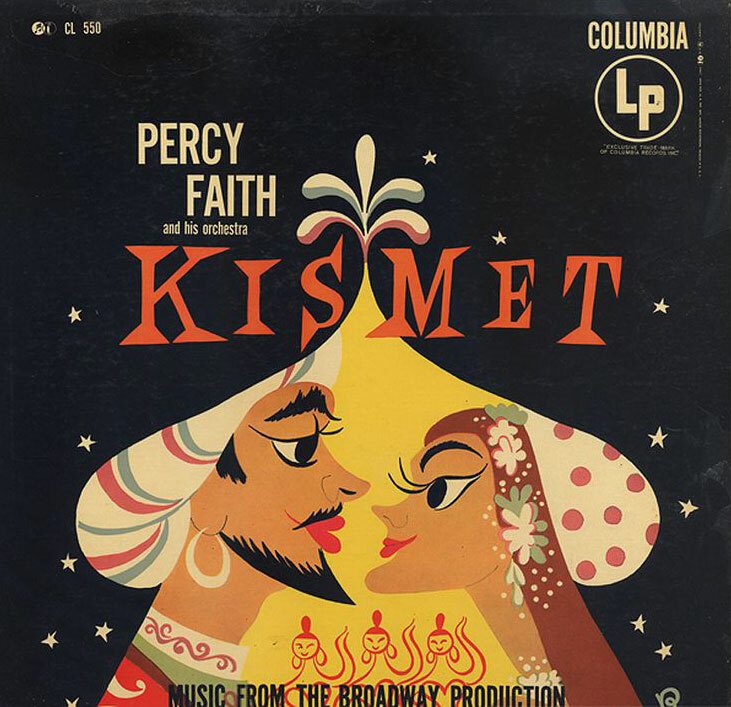 As he has endlessly demonstrated in his recordings of Latin American music, popular ballads and favorite standards, Percy Faith can color a melody as few can, and this instrumental presentation of Kismet makes it abundantly clear that the music of the Arabian Nights is highly congenial to him. Listen, then, to Kismet, one of the biggest hits of the 1953-54 season, and one of the most enchanting scores of any season.